Michael Jackson's "Man In The Mirror" Inspirational Meaning - Motivate Amaze Be GREAT: The Motivation and Inspiration for Self-Improvement you need! We bring to you an amazing song by Michael Jackson entitled "Man in the mirror". The song was part of the 1987 Jackson's "Bad" album. Another Song That Truly Inspires Us. This song its a conscious song by a iconic figure from the 80's. What's so special about it? Well... its not very often that you see a popular star releasing a song about self consciousness and awareness, but that wasn't the case with Michael Jackson, throughout is career he released many conscious songs, this is one of them. We picked "Man in the mirror" because it shows how important it is, that if you, want a make a change in the world, you have to start with you first. 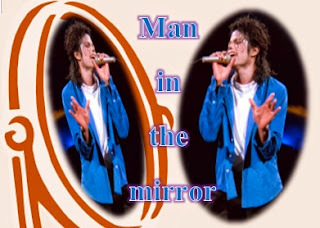 The Meaning Behind "Man In The Mirror": It opens up with a decision being taken, making a change. That moment when you are so fed up, that you finally decide enough is enough! You should be able to take decisions like this in your life. Put yourself in position to do so by analyzing the results you're getting. If you aren't getting any near, make that change, take that decision. It all starts with a decision and a thought, than comes execution: I'm going to change, make a difference, make it right! Pretending not to see their needs"
The Meaning Behind "Man In The Mirror": If you are going to make a change you might as-well put on your best clothes, give yourself a boost of confidence and start to execute. On the other hand you cannot think only about you, you have to care about others. "Who am I to be blind?" it shows you no matter who you are you have to care about others, no one is free from it, embrace it. That's why I want you to know"
The Meaning Behind "Man In The Mirror": Ignoring, discarding, feeling sad, being broken, all sad situations. That's how people get fed up with situations. But notice, you can't stop being fed up forever, you will be, because life its about ups and downs. It's when you're down that the urge to change comes. So embrace it also, a better day is coming, sometimes we must see the dark, in order to look out for the light. Take a look at yourself, and then make a change"
The Meaning Behind "Man In The Mirror": This is it! "No message could have been any clearer", you want to make a change? Start with you, with yourself, the man in the mirror. Talk to yourself, ask yourself to change what you do. Of course this is figurative, this is all about being introspective and personal development. Analyze yourself, uncover your weaknesses and strengths, make a change on what's weak, maintain your strengths. Be driven to get better and better each time you "look in the mirror". Could it be really me, pretending that they're not alone?" The Meaning Behind "Man In The Mirror": "selfish kind of love" - you have to love yourself but you cannot be all about you. We all been thought it, only thinking about ourselves, being selfish about possessions, wanting everything to ourselves, come on...There is much more outside that selfish zone. That's what we need to realize, everything we have is a blessing, a blessing that some don't have. Give value to what you have, and share with those who have less. This will get you to experiment an unique feeling of being worthy to others, rather than just to yourself. That's why I'm starting with me"
The Meaning Behind "Man In The Mirror": Again, there's lot of negative and sad things out there. But someone has to come and stop this flow of sadness. And that's where you and me can enter this story. By making a change in ourselves, we stop the negative flow and eventually it will spread to others. It's all about changing yourself in order to be a better individual, that will have his part in making a world a better place. The Meaning Behind "Man In The Mirror": We all have the desire to make a change. But if you concentrate on the whole world to change you'll get nothing. That's why focusing on yourself its very important, because you can't control the world, but you can control yourself and your actions. So you focus on what you can control, and you start from there making a change in the world. Start small, by changing yourself, and by doing so you will achieve big, because you are changing the world.